Woo Hoo!! It's fall, I've got my fabric, I've got my window of opportunity and I'm finally starting on Birdseye!! It seems like it took forever for this project to make its way to the top of my To Do list. 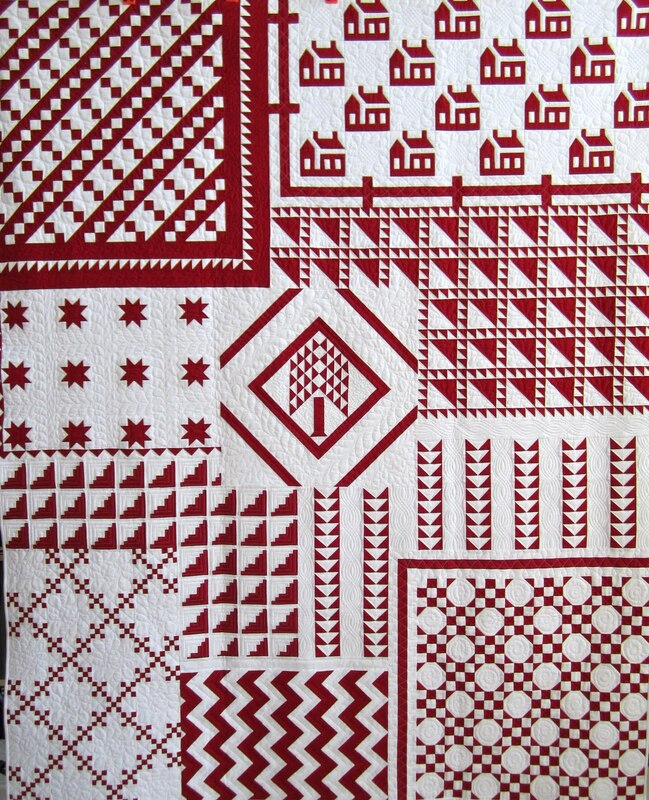 I've drooled over this pattern for at least 18 months. 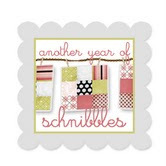 Birdseye is by Carrie Nelson for Miss Rosie's Quilt Co. I like the size of this quilt (it finishes at around 80" x 80"), I like the dark background, I like the big star blocks and I LOVE those nine patches dancing around everywhere. I bought three different background fabrics, all black, for this project. But I just wasn't 100% sold on any of them so I kept looking, until I finally decided on this one. 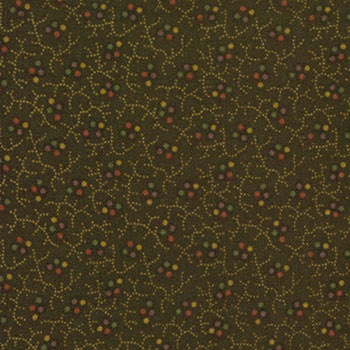 It's Kansas Troubles Favorites by Kansas Troubles Quilters for Moda, and it's brown, not black. I like the color of this brown and I like the little hint of additional color in the background. 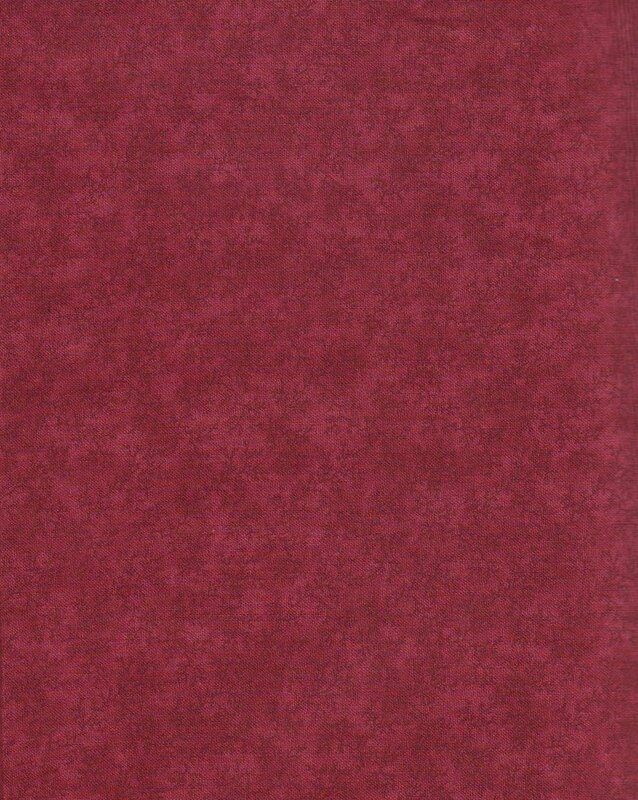 I can't take credit for choosing this background fabric, the talented ladies at Quilts Plus in Indianapolis had this fabric in a Birdseye kit. But as soon as I saw it I knew that was the fabric for my Birdseye. 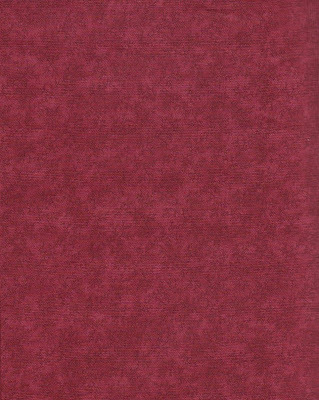 The red accent fabric I'm going with came from my stash and is a perfect match for the dark background fabric. I'm using the red vine fabric from the Stars and Coxcombs collection by Terry Clothier Thompson for Moda. So in addition to drooling over the pattern and the searching for the perfect background and accent fabric for the last 18 months, I've also been collecting fat quarters for the stars and nine patches. I wanted 25 coordinating fat quarter sets (two matching fat quarters for each star) so each star would be unique. I figured I would also use that fabric for the nine patches, 50 different fat quarters should be enough, don't you agree? Anytime a couple of fat quarters would catch my eye I would buy them and throw them in my Birdseye project box. Imagine my surprise when I got out my project box and sorted through my fat quarters to find 45 sets of fabric combinations which I was able to narrow down to 37 perfect sets for my Birdseye! I guess that's the problem to have, but I don't know how I'm going to only pick 25 sets out of the 37 sets, but I figure as I make my star blocks and throw them on my design wall, I'll get a better feel for what the quilt needs as far as fabric color and contrast. Here's my inspiration block, and I'm inspired. I'm coordinating the star points but not worrying so much about the nine patch in the middle. I figure my 25 sets of fabric (50 individual pieces) will give me a nice variety and a good look, no need to try and coordinate a third fabric for the center, right? Even though I did go and raid my stash to select a different coordinating fabric for the center of my first block, I won't have to do that for the remaining 24 star blocks, I can go scrappy, I can throw caution to the wind, I have the confidence to know that 50 different fabrics is all this quilt needs, trying to find 24 more fabrics to go with the star points would just be crazy! In addition to the colored fabric I'm also going scrappy for the light background fabric. Like you, I'm squeezing in my sewing around holiday responsibilities, but I'm looking forward to tacking both, a different sort of marathon! Ready, set, GO!! a week full of fun, shopping, game playing, watching movies, connecting with family, and most importantly laughing. No sewing to speak of, but that can wait. My table's set and the turkey is in the oven . . .
Best wishes to you all, whether it's Thanksgiving Day where you live or not! 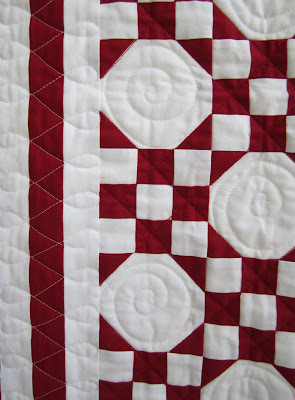 Several of you sent me notes about my blog redesign saying not only did you notice that my blog was now sitting in the middle of my Red and White Tribute Quilt, but it looked like my Red and White Tribute was quilted! Very observant of you, and so right! Yes it's true, my Red and White Tribute Quilt has been quilted. It was quilted by Connie Lancaster at Quilts Plus in Indianapolis, IN. Here it is, all done. I could not be happier. Each mini quilt in this project was quilted uniquely. 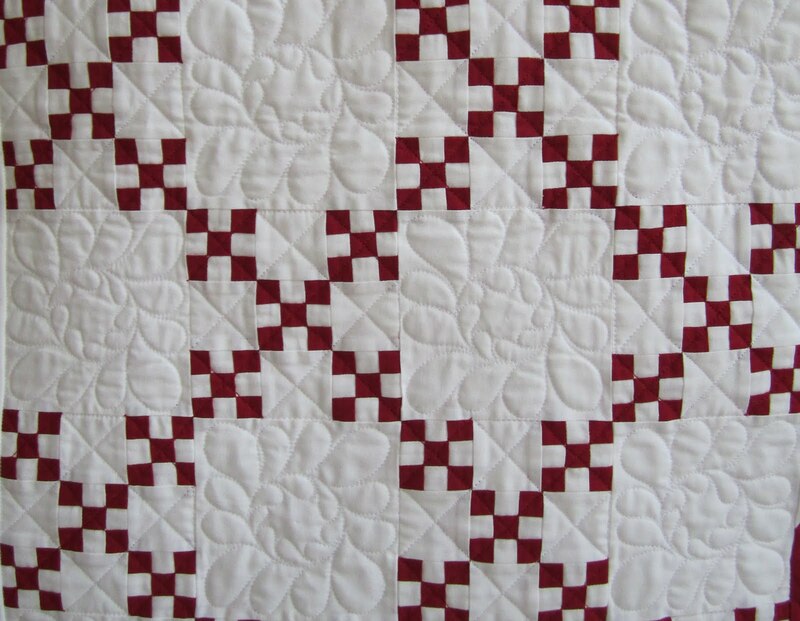 Connie went with a perfect combination of new and old quilting designs, I think it adds so much to the overall look and feel of the quilt. So here's the center, it's hard to go wrong with feathers. 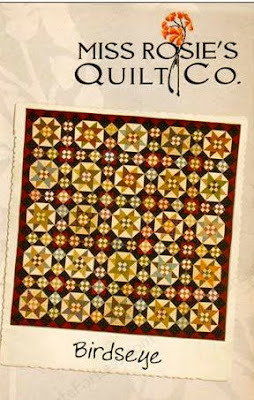 We chose a more modern design for the Jacobs Ladder quilt. And some swirls for the snowball blocks. and some wreaths and crosshatching for my houses. 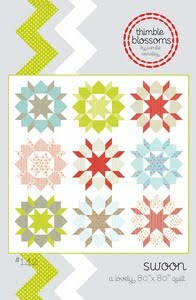 Finally, a different wreath pattern for the double nine patch quilt. It's so hard to believe that after spending my whole summer devoted to this project that it's all done. Nothing left to do now but enjoy it! Hey, thanks for all the great feedback on my new blog look! I was a little worried when I showed my new look to my husband and he said, " I liked the old design better". But when I shared that with a friend she mentioned that most husbands don't like change, and how we woman folk like to move the furniture just for fun (that's so me!) but men don't usually take to the new look right off. I'm also taking the comments that were something like, "that sure is red" as a good thing....that's what you meant right? It's sort of like those comments "did you get a new hair cut" followed by nothing. My Baby's Swoon or Baby Swoon as she is called is done. I enjoyed every minute of making this project. This block is amazing and has unlimited potential. It works for any style of fabric and for any level of sewing. If you are a beginner quilter and have been scared to tackle a large bed size quilt, look no further. I'm keeping this pattern in the back of my mind, I think an itsy bitsy baby swoon, one where the blocks are 8 inches would be interesting to try. So here's where we left off . .
Block 1, then it was on to . . .
Block 2, then . . .
Block 3, and finally . .
and thought they looked so pretty, but wanted to use just a little more of that Nine Dots fabric . . .
so I added a thin border. I don't use white background fabric near enough in my projects! For some reason I tend to use off whites or ivories, but I really love the crispness that the white background fabric adds to this project. 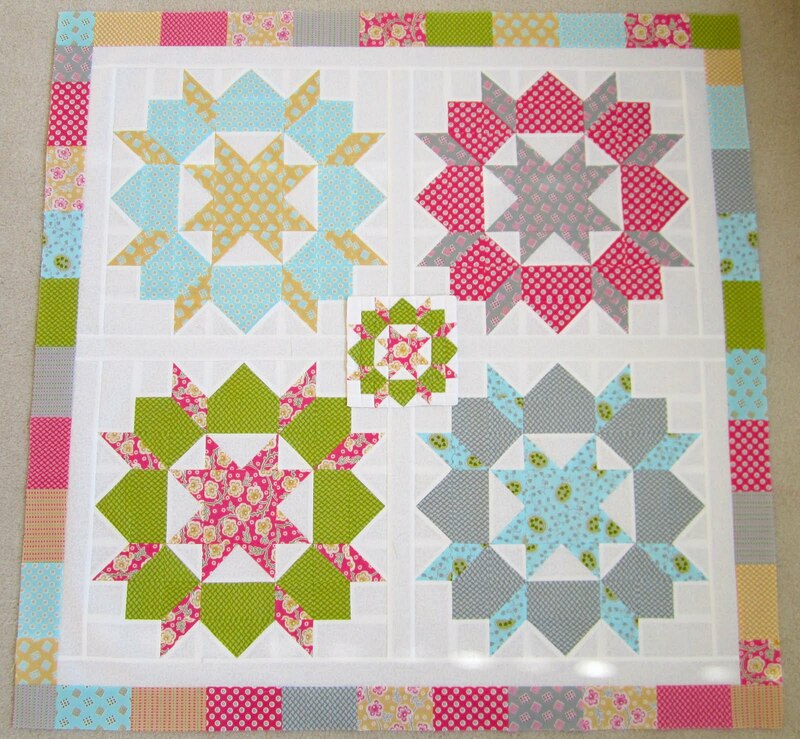 Baby Swoon is Lifetime Quilt Number 76. She finished at 41" x 41" and has approximately 371 pieces. The fabric is Nine Dots by Carrie Nelson of Miss Rosie's Quilt Company for Henry Glass. 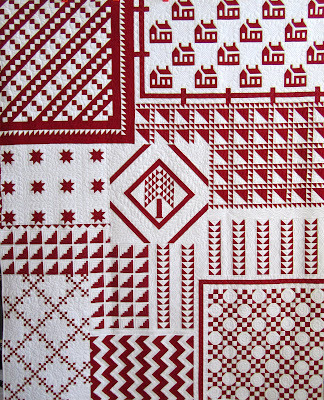 And the pattern is Swoon by Camille Roskelley for Thimble Blossoms. 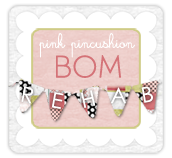 I thought it was time for a blog make over. As much as I loved my last look, after seeing it every day for well over a year, I was ready for something different. What do you think so far? I'm in the process of getting everything moved around and settled and hope to be done remodeling soon! So I'm sure you're thinking, "next up, now that Door County Cherry Baskets is done I'm sure Thelma's starting on Birdseye, that quilt she's been wanting to make for over a year, that quilt she's been collecting fat quarters for, that quilt she's wanting to make in the fall, because she likes to work with fall colors in the fall, that quilt with the bazillion pieces that she needs to get a jump on so she can meet her arbitrary deadline of November 30th plus squeeze in Thanksgiving, yessiree, I bet that Thelma's all over that Birdseye project". Well that was the plan, and you know I'm a girl who loves a good plan, but somewhere along the way, as I was doing my normal end of project cleanup, this little bundle kept catching my eye. I don't know if it was the three days of gloomy weather or my hormones, but I got a powerful itch to do something with that bright happy fabric. Beautiful fall foliage staring back at me from every window in this house, pumpkins setting on the porch, but I just wasn't ready to succumb to fall. and this pattern in my brain after several folks left comments that Swoon was their favorite pattern, I told Birdseye she would have to wait, not long, just a couple of days. My daughter asked me awhile back if I would make a wallhanging for her office, I think this fabric, Nine Dots by Carrie Nelson for Henry Glass and that pattern, Swoon by Thimble Blossoms are the perfect combination and will make a nice little work of art for a California girl. I'm giving myself three days to come up with a baby Swoon for my baby's office. Here's my version of Lisa Bongean and Carole Charles' pattern, Door County Cherry Baskets, from their book, Summer Gatherings. I made mine a little smaller, 8 by 8 blocks instead of the 9 by 10 blocks in the pattern. 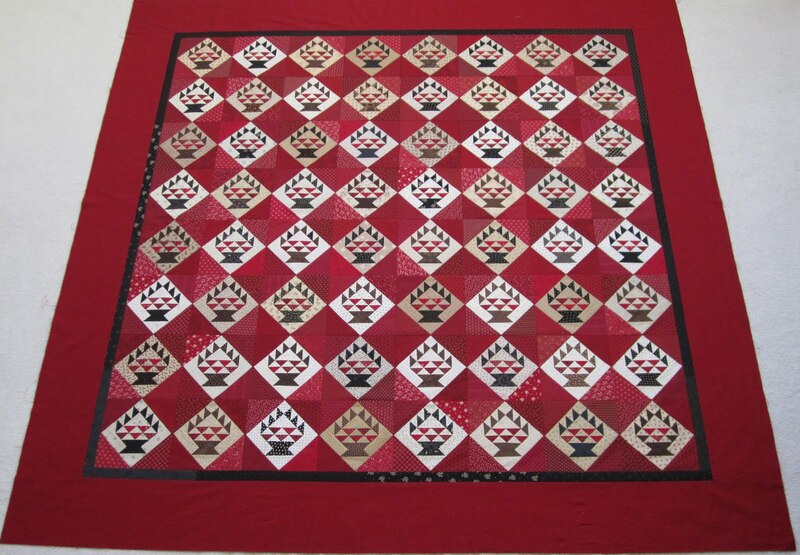 It finishes at around 90 inches square, has approximately 2,069 pieces, and is Lifetime Quilt Number 75. To make sure I kept that perfect block placement I numbered each block with a post it and did not remove the post it until the row was connected. I left the row number on the first block in each row. I think it looks like I managed to get them all together just like I wanted and most importantly, no like reds are touching. The whole time I was making my baskets I was fretting over the border. That plain red border did not appeal to me at all. But once I got all my baskets together I realized they needed that red fabric to frame them. I'm glad I followed the pattern. 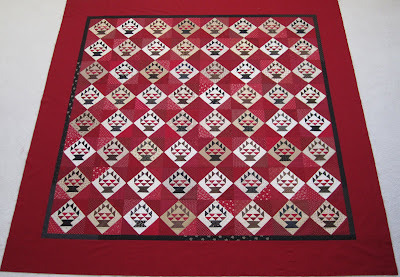 The red I used for the border is from the Cotton Club line by Bonnie Blue Quilts for Marcus Brothers Fabrics and is called Red Bubble Dots. I thought it would be fun if it looked like I picked all the cherries there were, and put only 3 in my last basket instead of the 5 in all the other baskets. You know me, I just have to be different somehow!